Two bedroom, 2.5 bath townhouse in the Village of Oak Creek facing the beautiful Red Rocks of Oak Creek Canyon. Minutes from Bell Rock and other great hiking spots, Sedona Golf Resort, Oak Creek Country Club, Canyon Mesa Country Club, The Hilton Spa, Oak Creek Outlet Mall and many great restaurants. 10 minutes from uptown Sedona. Enjoy a free round of golf at Canyon Mesa Country Club or a free day pass to the Hilton Spa or a free half day bike rental at Absolute Bikes. Get away to the incredible red rock formations found only in Sedona and Oak Creek Canyon; a hiking, biking and photographers wonderland. I am a retired business man from the POS/cash register industry. I now manage our 4 vacation rental properties and try to find time to golf and travel with my wife. We purchased this townhouse because of its location in the Village of Oak Creek, its proximity to restaurants, shopping and outdoor activities and it is zoned commercial so short term vacation rentals are not a problem. The townhouse is spacious (1240 SF) and built with the highest quality materials and furnishings such as granite counter tops and stainless steel appliances. The Village of Oak Creek which is in our opinion the best location in the Sedona area as the traffic is much less congested than West Sedona, Uptown Sedona or Oak Creek Canyon. We have great views of the Red Rocks. Sedona is one of the top tourist destinations in the world with year round travelers. Every day is a weekend. Our townhouse is located close to Bell Rock. It has great views and is walking distance to many restaurants and shops. We are close to 3 golf courses, tennis, hiking and biking. There is a great bakery right across the street. We include a free day pass to the Hilton Spa, a free round of golf at Canyon Mesa Country Club or a half day bike rental at Absolute Bikes with your rental. All are close to our townhouse. 2 parking places are provided in front of the townhouse. 42' Flat Screen HDTV with Soundbar. DVR so you can pause live TV and record the shows you like. With option at Absolute Bikes. There is a bike rack available at the end of the building of units L - K.
Large concrete patio with table and 4 chairs plus 2 additional lounge chairs. The condo was as advertised and we were very pleased with our 4 night stay here. The location is perfect and everything you need is within walking distance. It was a real bonus to have a DVR so we could record our favorite programs and watch them after spending a day exploring. My best friend and I booked this unit for a week. Everything we could have wanted was provided. The red rock pass was a nice touch. The powder room on the first floor added to our comfort. All the appliances we needed were there. The unit was very quiet with no noise disturbances. The patio with grill was lovely. Restaurants and grocery were nearby.. Decor was very pleasing. Just a lovely comfortable place to stay. Great place to stay in Sedona. Loved being out away from city center. within walking distance to several red rock hikes. Had everything we needed to have a comfortable stay. 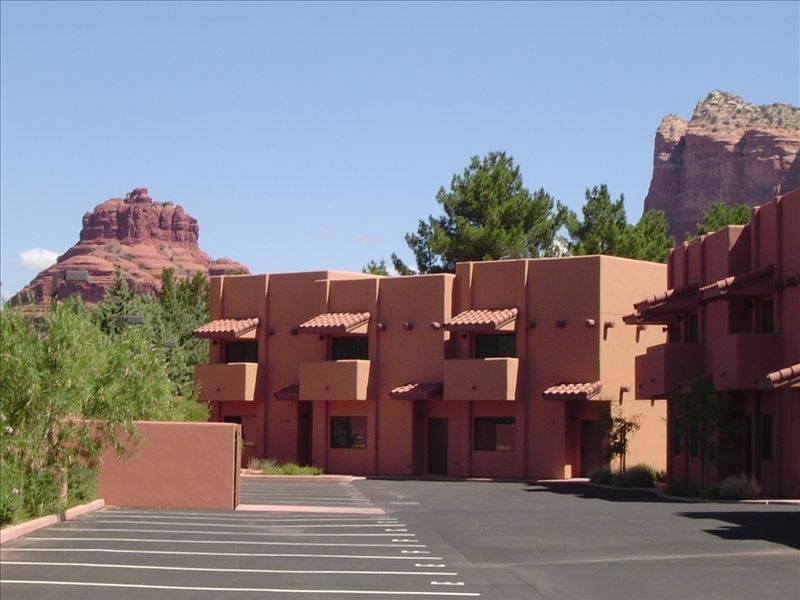 Sedona is a wonderful place and the townhouse was very comfortable and well equipped. We had everything we needed and the beds were very comfortable. I loved every minute of my stay. We are located in the Village of Oak Creek. Hiking, biking shopping and great restaurants are within walking distance of our townhouse. Rent includes pass to the Hilton Spa, free golf at Canyon Mesa Country Club and/or free bike rental at Absolute Bikes. Holidays have a 3 night minimum. Rates are subject to change until confirmation. Monthly rates not available in March, April, September and October.